The Seven Kingdoms have fallen asunder, as the sadistic teenager, Joffrey of House Lannister, ascends the Iron Throne following the death of his "father," Robert the Usurper. The Stark family in the North rises to power to combat this ascension, and the empowered Daenerys, the exiled last heir of the former ruling family, seeks a way to return to Westeros and rule it. Meanwhile the Night's Watch, the orphans and criminals who guard Westeros from the barbarians who live beyond the Wall find their numbers dwindling in the face of fantastical forces. Anonymous : These books are so fascinating! It's almost like a game of chess. One character moves and another blocks. The stories of each individual are so interesting and the way they interact is unreal. You can't put it down for dying to see what will happen next. Atlanta, GA: Meisha Merlin Publishing, Inc., 2003. First Edition Thus. One of 448 numbered copies signed by the author, illustrator, and cartographer, this being copy no.280. Thick octavo (23.5cm); maroon cloth, with titles stamped in gilt on spine; top edge gilt; dustjacket; publisher's gilt-stamped maroon cloth slipcase; 892pp; illus. Fine in a Fine dustjacket and slipcase - virtually as new. The second volume in Martin's critically acclaimed 'A Song of Ice and Fire' series, and the last of the exquisite volumes in the series produced by now-defunct publisher Meisha Merlin. Atlanta: Meisha Merlin Publishing, 2003. One of an edition limited to 500 copies, this being # 233. Hardcover. Near fine/Near fine. John Howe and Charles Keegan. Atlanta: Meisha Merlin Publishing, 2003. One of an edition limited to 500 copies, this being # 233. Signed by the author and illustrators. Numerous b/w illustrations. Illustrated by John Howe and Charles Keegan. 892 pp. Hardcover. 8vo. Burgundy cloth. Top edge gilt. A very nice copy, housed in publisher sliipcase. Near fine/Near fine. (Insurance required to ship this item). Seller: A. Parker's Books, Inc.
Burton, MI: Subterranean Press. Burton, MI, Subterranean Press, 2014. Limited Edition. Hardback. 242/500 Copies. A fine copy. Two volumes in slipcase. Presented with the artist's chap book. Signed, as issued, by author and illustrator. Illustrations by Richard Hescox [7560, Hyraxia Books]. . Fine. Hardback. Limited Edition. 2014. Voyager [HarperCollins], 1997. Hardcover. Near Fine. A first edition, first printing published by Voyager in 1997. A near fine book with a very small stain to the top edge, without inscriptions. In a near fine unclipped wrapper with one internal repair to the spine (thin crease). The rare second instalment in the brilliant series. New York: Bantam, 1999. Book. As New. Hardcover. Signed by Author(s). 1st Edition. Bantam, 1999, New York. Hard Cover. Condition: As New. Dust Jacket Condition: As New. First Edition/Eleventh Printing. Unread - Fresh and crisp straight from the bookstore shelf except for a previous owner inscription (poi) on the back of the front free endpaper (see photo). Inscribed by the author in my presence at a local bookstore signing. Red titles on black binding with brown boards, beautiful map endpapers. Boards are straight and stiff. Binding is tight and still new.Tiny ding on front cover bottom tip. Tips pointed and clean otherwise and odor free throughout except for Author's signature and poi. Jacket has a tiny tear and three tiny holes at top of spine but now looks spectacular in its shiny mylar dust protector. Shipping box is suitable for wrapping with a non-price listed purchase order inside along with biodegradable packing..
HarperCollins Publishers, 2011-09-01. Hardcover. Good. Bantam. Hardcover. 0553108034 First edition, First printing. Not price clipped. NOT REMAINDER marked. Dust jacket in protective cover. Shipped in a box. Number line starting with a (1). Fine/Fine Best copy I have seen. . Fine. Bantam. Very Good+ in Very Good+ dust jacket. 1999. First Edition; First Printing. Hardcover. 0553108034 . Some very tinty dents on bottom boards; A Song Of Ice And Fire, Book 2; 768 pages . New York: Bantam. Near Fine in Near Fine dust jacket. 1999. First Edition; First Printing. Hardcover. 9780553108033 . Gently read copy. International orders may require additional postage. ; Full number line. 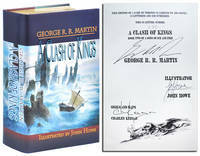 ; A Song of Ice and Fire, Book 2; 1.9 x 9.4 x 6.3 Inches; 768 pages . New York: Bantam Books, . First edition. Hardcover. Very good+/Very good+. New York: Bantam Books, . First edition. 759 pp. Hardcover. 8vo. tan cloth backed, paper covered boards. Some light creasing to the head and heel of the spine. more so to the heel of the spine, as well as along the bottom edge of the front cover. Contains multiple appendices describing the houses and characters . Very good+/Very good+. Random House, New York, 1999, First Edition (later printing), boldly Signed by author. Hardcover with dust jacket, pp. 754, 24 x 16 x 4 cm, quarter bound - black paper-covered board with black spine, The North and The South maps on endpapers by Jeffrey Ward, pictorial jacket with crown. Fine in Fine. New York: Bantam Books, 1999. Book. Near Fine. Hardcover. First Edition/First Printing. A square solid tight very carefully read copy. The edges of the text block has some light soil, a nudge to the heel and top of the spine. The priced jacket has some light edge wear, light rubbing. THIS COPY IS IN MY POSSESSION AND NORMALLY SHIPS NEXT DAY..
Bantam. MASS MARKET PAPERBACK. 0553579908 Brand new book.Buy with confidence. Money Back Guarantee.Expedite Shipping Available. International shipment available. . New. 2011-11-01. New. Ships with Tracking Number! INTERNATIONAL WORLDWIDE Shipping available. Buy with confidence, excellent customer service! BCA, 1998. Book Club Edition. Hardcover. Very Good Condition/Good. Illustrator: Jim Burns. VG-/Good+ 1998 BCA/Voyager hardback, unclipped DJ, original striking jacket artwork by legendary fantasy artist Jim Burns. Scarce original 1998 issue, hard to find in Voyager or BCA/Voyager, this retains the wrapper design and full size format of the Voyager edition. Corners a little bumped with some page tanning typical of this edition. Top edge crease to DJ with 1cm top front corner tear to DJ, small nicks around top of DJ spine, else near VG tight and unmarked. More by this author available Sent Airmail at no extra cost; Worldwide Shipping IMMEDIATE 1ST CLASS/AIRMAIL DISPATCH Illustrator: Jim Burns. Quantity Available: 1. Shipped Weight: Under 1 kilogram. Category: Science Fiction & Fantasy; Pictures of this item not already displayed here available upon request. Inventory No: 072143..
1999-03-06. New. Ships with Tracking Number! INTERNATIONAL WORLDWIDE Shipping available. Buy with confidence, excellent customer service! Random House Audio, 2012. CD-Audio. New. 5.9 x 5.1 cm. 2003-09-07. New. Ships with Tracking Number! INTERNATIONAL WORLDWIDE Shipping available. Buy with confidence, excellent customer service! 2000-07-01. New. Ships with Tracking Number! INTERNATIONAL WORLDWIDE Shipping available. Buy with confidence, excellent customer service! 2002-02-04. New. Ships with Tracking Number! INTERNATIONAL WORLDWIDE Shipping available. Buy with confidence, excellent customer service! 2000-04-03. Good. Ships with Tracking Number! INTERNATIONAL WORLDWIDE Shipping available. May not contain Access Codes or Supplements. May be ex-library. Shipping & Handling by region. Buy with confidence, excellent customer service! London: BCA, 2002 First edition, third printing. Book Two of "A Song of Ice and Fire". In black cloth boards, near fine, tight, clean covers. Gilt titles on tight spine. Clean end papers. Slightly tanned cut edges. The text block is very good, tight but with very slight tanning around the edges. In pictorial dust jacket all the way round, very good, except for chipping along top edge. Not price clipped.Scarce. Bantam. Hardcover. 0553108034 First Edition [1st Edition]. Very Good, mylar-wrapped dust jacket. . Very Good. 1999. First Edition [1st Edition].. Edition: First Edition [1st Edition]. 2011-11-01. Good. Ships with Tracking Number! INTERNATIONAL WORLDWIDE Shipping available. May not contain Access Codes or Supplements. May be ex-library. Shipping & Handling by region. Buy with confidence, excellent customer service! Paperback. 8956601399 Please allow 4 - 14 business days for Standard shipping, within the US. Thank you for supporting our small, family-owned business! . New. 2006-01-01. Paperback. 8956601399 Please allow 4 - 14 business days for Standard shipping, within the US. Thank you for supporting our small, family-owned business! . Fair. 2006-01-01. Paperback. 8956601399 Please allow 4 - 14 business days for Standard shipping, within the US. Thank you for supporting our small, family-owned business! . Fine. 2006-01-01. BANTAM. New. 9.56 x 6.79 cm. 2012-06-09. Good. Ships with Tracking Number! INTERNATIONAL WORLDWIDE Shipping available. May not contain Access Codes or Supplements. May be ex-library. Shipping & Handling by region. Buy with confidence, excellent customer service! HARPER COLLINS PUBLISHERS. Hardcover. 0008115419 Brand New ,Original Book , Direct from Source , Express 5-8 Business days worldwide Delivery. . New.